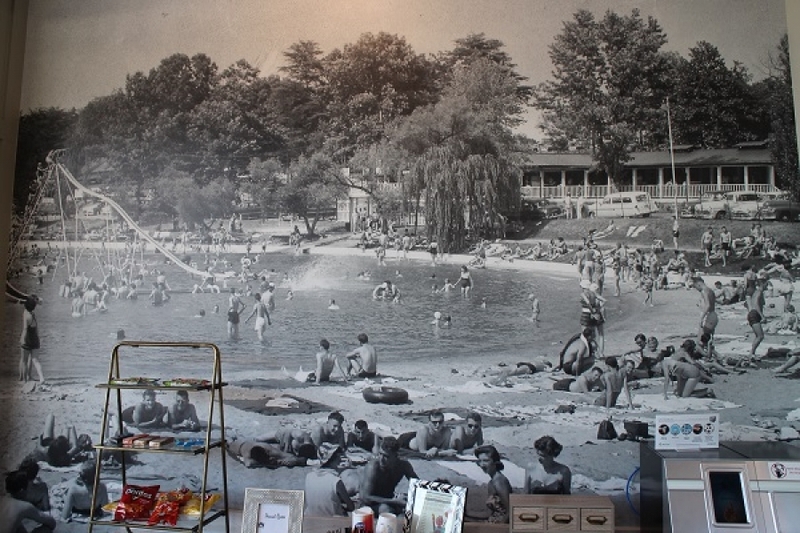 Photos in the lobby show Moore's Lake in its retreat days. 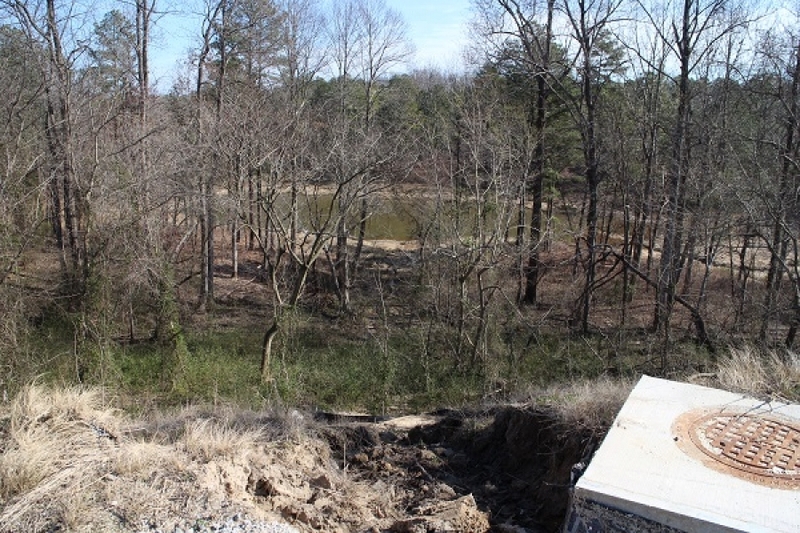 Part of the lake as viewed from an edge of the development. Work continues on a second 100-unit building. The first of two planned phases of George Emerson and Phil Roper’s latest apartments collaboration, called The Jane at Moore’s Lake, is nearing the finish line, with work wrapping up on one four-story building, a nearly identical building under construction next door, and a larger, third building in the works for the later phase. The $60 million project, planned to ultimately total 385 apartments, includes one-, two- and three-bedroom units ranging from 800 to 1,400 square feet on average, with monthly rents ranging from $1,200 to just under $2,000. Two penthouse units, one of which has been leased, rent for $3,000 a month, with two-level floor plans each totaling 1,600 square feet. 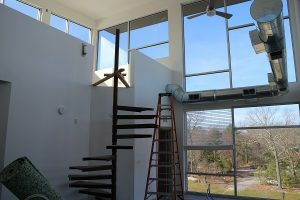 A spiral staircase connects one of the two-level penthouse units. The development revives a nearly 60-acre tract that was once part of the Moore’s Lake retreat, a vacation spot along U.S. Route 1 that preceded Interstate 95, which lines the opposite edge of the site. The largely wooded area is between state routes 10 and 288, near the large American flag and pole that RJ Smith Cos. recently erected along the interstate. The retreat included about 40 cottages built in 1929 – one of which recently was relocated about five miles north to Chesterfield County’s Falling Creek Ironworks Park, where it will be featured in an event this May commemorating the 400th anniversary of the first English ironworks in North America. More recently used as a mobile home park, the site is now anchored by the two apartment buildings, each totaling 100 units. The third building, which would add 185 units, is being designed by the project’s architect, Midlothian-based Poole & Poole Architecture. Roper, whose work with Emerson includes the Colony Village Apartments about two miles north and the Valley West Apartments in Shockoe Bottom in Richmond, said The Jane at Moore’s Lake brings a city aesthetic to suburban Chesterfield. The rear side of one of the 100-unit buildings. 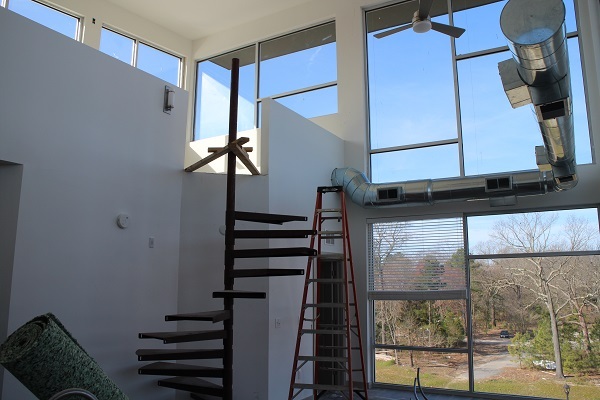 “This is more of an urban style than a regular old three-story walkup. We like to say it’s the urban look in the suburbs,” said Roper, who’s been developing apartments for decades and started collaborating with Emerson about 20 years ago. The Moore’s Lake property had been zoned in 2007 for a massive development that, with the economic downturn, never took off. Roper said David Smith with Cushman & Wakefield | Thalhimer reached out to him and Emerson about the 59-acre parcel, which they purchased in 2017 for $3.8 million. 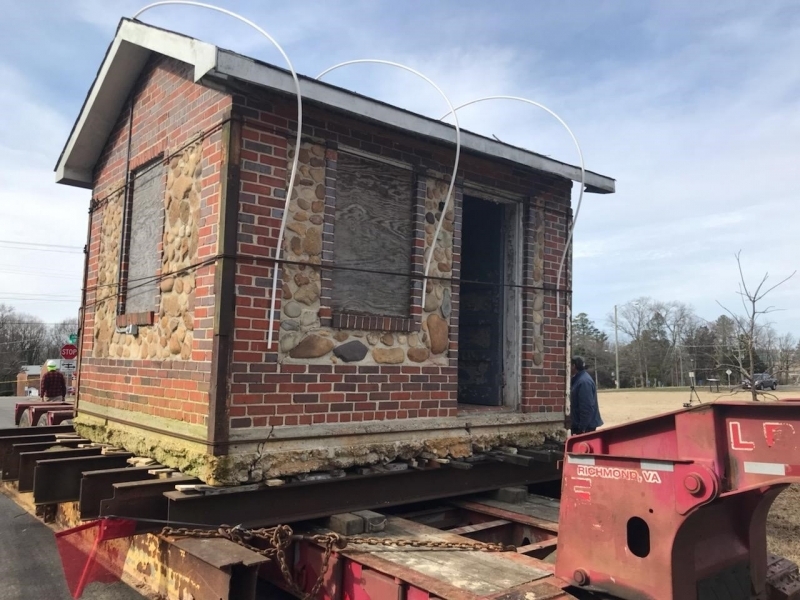 Other land that makes up the retreat site remains owned by LLCs tied to Chesapeake Mobile Homes, a Maryland-based mobile home dealer owned by David Sherrill. Roper said some of the land is being eyed for retail development, as indicated by construction underway along Route 1 for a Popeyes restaurant and a Panda Express. The buildings include rentable garages. 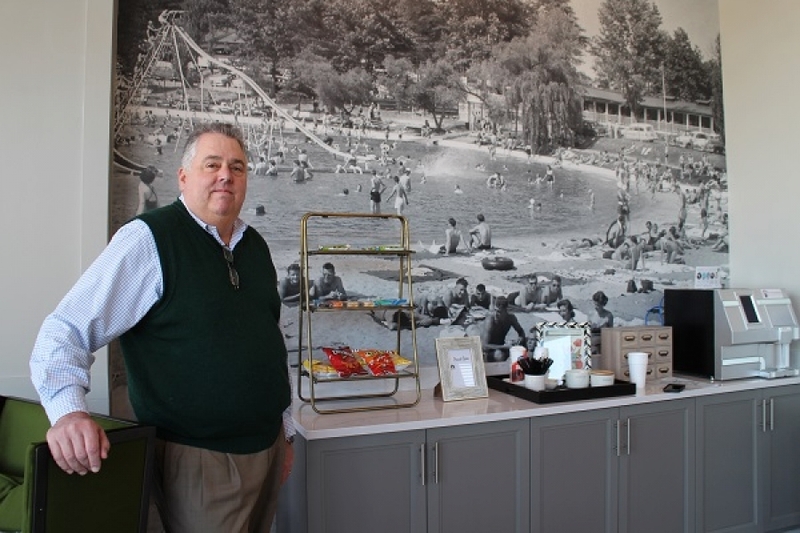 While the apartments are adjacent to their namesake lake, access to the lake is not among their amenities, which include a clubhouse, pool, fitness center and Wi-Fi. 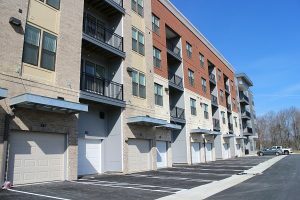 The buildings include unassigned garages that tenants can rent in addition to their lease, and apartment rents include satellite TV, internet and trash pickup. About 30 percent of the project’s initial 200 apartments have been leased so far, with each of the first two buildings averaging about 104,000 square feet of gross rentable space. 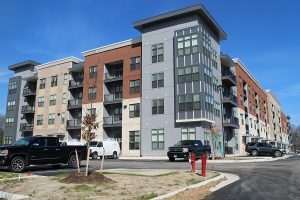 The property is managed by Atlanta-based Matrix Residential, which started leasing in December and started move-ins in late January. About 85 percent of the project’s $60 million cost is being financed through a loan from the U.S. Department of Housing and Urban Development, Roper said. He said the 40-year loan is non-recourse, fixed-rate and construction-to-permanent, a type of loan that converts construction debt to a permanent mortgage once construction is complete. Roper said he and Emerson served as the general contractor on the project, subbing out the majority of the work to Roanoke-based Branch & Associates. 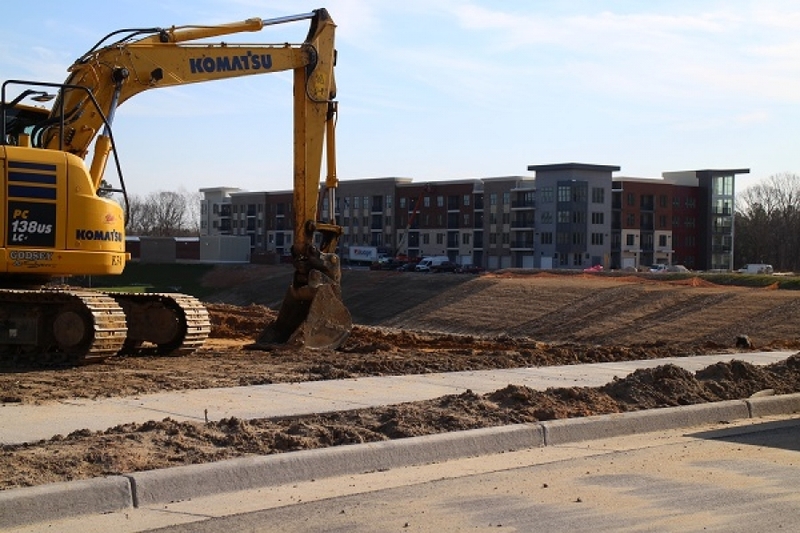 Elsewhere in Chesterfield, Emerson is keeping busy with another apartment development, this one a collaboration with Winterfield Place developer Casey Sowers on a 236-unit complex at Westchester Commons. 8 Comments on "From cottages to penthouses: Moore’s Lake apartments transform Chester site"
Approximately 30% of the cost of a new apartment is attributed to government regulations and delays. The cost of labor and materials increases at about 10% per year. Too bad typical COLA and/or general employment raises, etc. don’t keep up with 10% per year. Care to specify a little more about what government regulations and delays make up that 30%? Is it the regulations that require a building be constructed so it doesn’t fall down? The delay involved with unwinding the previous developer’s proffers was due to the former developer and likely what was promised based on a much larger development. These are wood framed right? If so, one can argue that the cost to build should be lower, given that wood framed 5 story buildings are far cheaper than what was previously deemed safe for constructing this size of a structure. And seriously, $2,000 for an apartment in Chester?!?! People, please go buy your home if you are paying this much, please! Highway, or routeway, robbery. Lastly, today’s architecture is so lack luster. Bring back the art of structural design! Couldn’t agree more Ashley. For that location to be directly across a Bojangles, Food Lion and a Sonic and next door to a Dollar Tree, $2000 rent for Chester, VA is criminal. Like you said, buy the house. From the article when the land was purchased (9/14/17) “The apartments will be one- to three-bedrooms, renting monthly from $850 to $1,500. ” From this article: ” with monthly rents ranging from $1,200 to just under $2,000.